p.h.d.elicious cooks plants in tiny kitchens | Plant-based Cooking! Oooh, I went all fancy tonight, courtesy of The Artful Vegan. I had to sub out the yuca for orange sweet potato, and the habanero for red jalapeno (unfortunately so, because habaneros are my favourite chile pepper!) Yet this dish, from the book’s appetizer section, totally hit the spot! The dijon mustard-mango sauce was amazing, and I’ll be making it again! 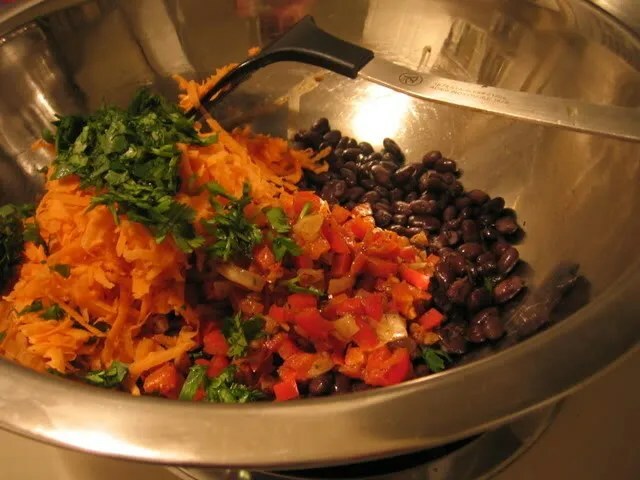 On top is the broiled tomato salsa that forms a sub-recipe of the general recipe–you know how those fancy Millennium restaurant recipes roll! I panfried the first batch of cakes, but knew it would rapidly become annoying (the pan was already full of that bane of vegan croquette existence: the stray particles due to near-disintegration of the whole business), so I baked the rest on an oiled pan, brushed with oil. Oooh, what a square meal! 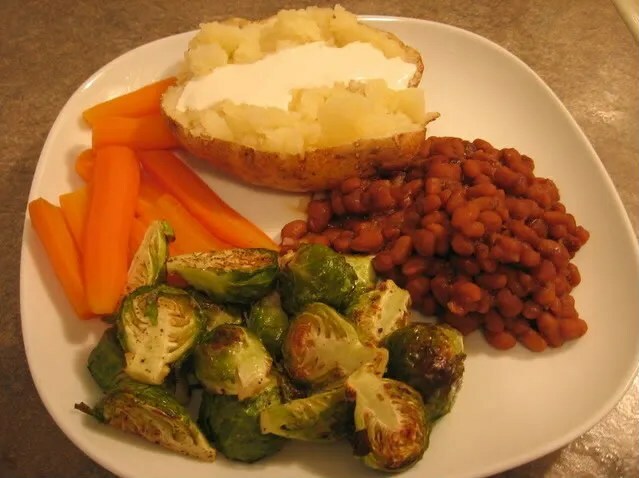 Roasted brussels, boiled carrots, baked potato with vegan sour cream, and baked beans. The baked beans are the Boston Baked Beans, from the 1968 cookbook Cooking for Company, by the food editors of Farm Journal. Of course, this cookbook can’t ever hope to attain the greatness of my favourite cookbook of all time, 1965’s Farm Journal’s Complete Pie Cookbook. Pie recipes stand the test of time far better than other dishes, and the kitsch quotient, er, historical interest, er, food and social mores that are horrifying, fascinating, and grotesque, all dwindle a bit in the intervening three years between publication dates. But Cooking for Company still ranks high in my small vintage cookbook collection. The hostess who lives on Cape Cod has no problem deciding what to have for supper when she has guests on Saturday. 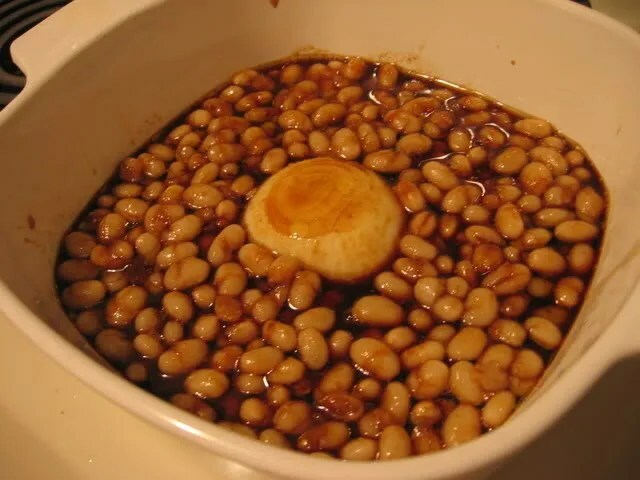 A pot of baked beans is the traditional main dish. Guests expect it. Women in other areas find this old-time favourite equally popular. There’s something friendly about the aroma of beans baking that permeates the house on a snowy evening. Here’s the recipe, halved and adjusted for lack of pork fat. Soak beans overnight. Place beans, salt, and water in a pot and simmer until tender, about one hour (mine were quite tender at a little less than an hour, depends on age of the beans). Measure out a scant 1 c. of bean-cooking liquid (add water if necessary), drain rest of liquid. In the bottom of a smallish casserole, drizzle a bit of olive oil and sesame oil, sprinkle with a bit of smoked salt (this sentence is what subs for the salt pork thing). See picture below! Add beans and wedge the onion into the middle. 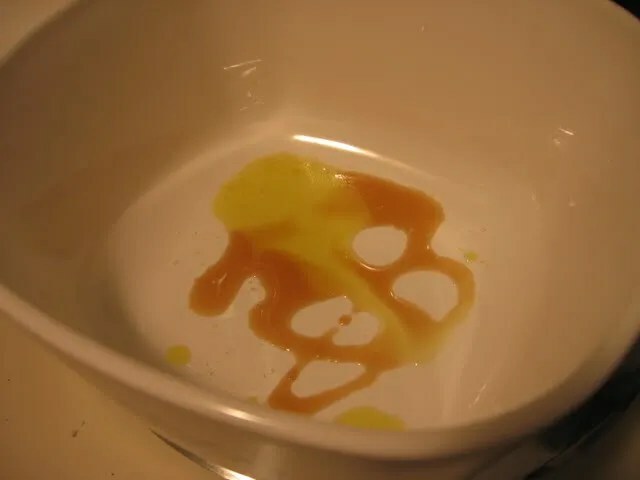 Mix the mustard, sugar, and molasses with the reserved bean liquid and pour over beans. See picture below! Drizzle a bit more olive oil over and a bit more smoked salt. Cover and bake five to seven hours “in a slow oven” (300F), adding more water if needed. I needed a little less than five hours. I find all baked beans a little too sweet to want all the time, but this was fun to make! This is the Best Red Bean Soup from Gourmet Today, one of those accidentally vegan recipes. I used up my old, pretty anasazi beans, and poblanos instead of cubanelles and aji dulces. They don’t seem to have cubanelles here that often–it’s interesting to see the regional differences in supermarket produce stock. Anyhoo, the soup itself is more subtle tasting than its ingredient list implied, but pretty delicious, especially after the first day. 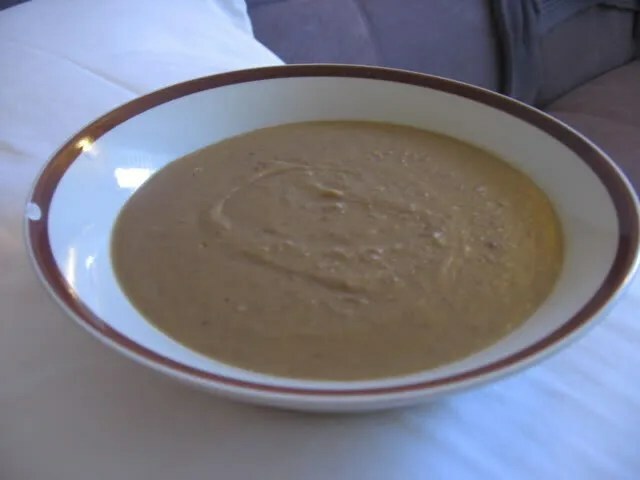 I think I’ve decided that I like my pureed bean soups pretty watered down, or they start to remind me of a big bowl of refried beans. Those are some of my bean soup thoughts. Doesn’t look too beany, does it! Well, the beans are in there in the form of fermented black soybean garlic sauce. This condiment is extremely strong and salty–you tend to only need a little. 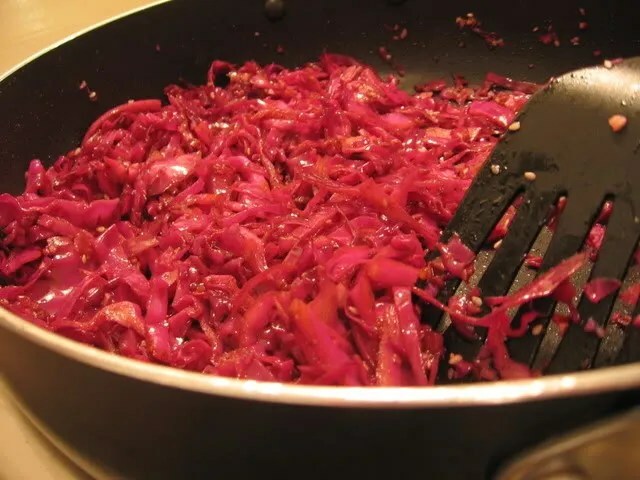 I had a fantastic little red cabbage from the campus farmers market. I love cabbage, but am often disappointed in the lack of freshness, the huge volume… This one was tiny, fresh, and perfect. I cut up the whole thing and used it here! I sizzled several cloves of garlic in some oil with a couple of pinches of red pepper flakes and some minced ginger. 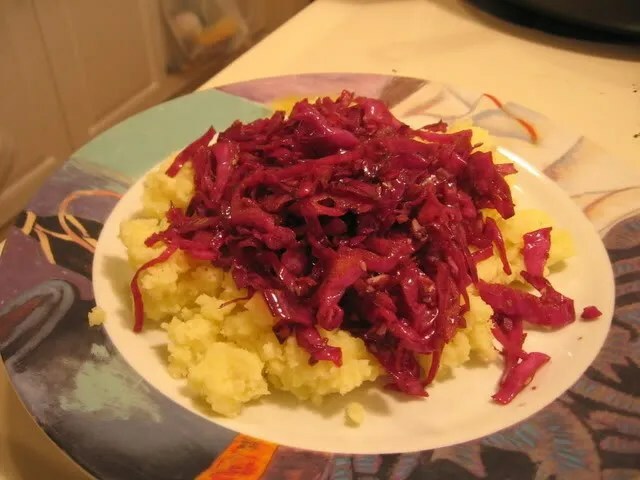 Then a fair-sized splash of cider vinegar along with the cabbage: I didn’t want any dark blue cabbage! I thought I remembered that the midnight blue cabbage syndrome was caused by acid, but luckily I googled it before starting to cook, and it turns out that acid actually prevents discolouration! Plus, the cider vinegar balanced out the black bean sauce quite nicely and gave the whole thing a tangy sweet and sour kind of taste. Speaking of the black bean sauce, once the cabbage had sauteed rather nicely (still a bit crisp, since the cabbage was so young and fresh and tasty that way) I mixed about a tablespoon of black bean sauce with a bit of water and sesame oil. In that went with some sesame seeds, and the whole thing cooked a bit more, before serving over some mashed potatoes, as pictured below! A bit of a crazy dinner, eh? I’ve got a brutal cold and all I wanted was something simple, comforting, and sinus-clearing. And this fit the bill! Very tasty. 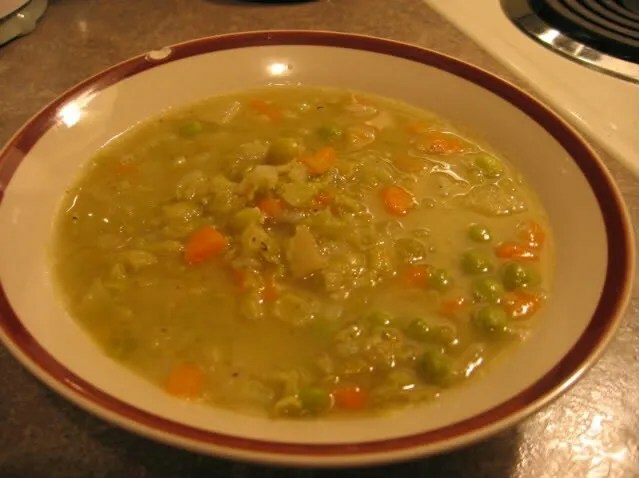 I posted a bunch last year on Anna Thomas’s Love Soup, a big book of seasonal vegetarian soups. I made tons of the soups from the book back then, but here’s one I hadn’t yet gotten around to. And it’s a delicious one! I love mustard in pea soups, and mustard sure has its role to play here. The recipe calls for a tablespoon of dijon, or more to taste. When I first finished the soup with the basic tablespoon of dijon, the soup tasted surprisingly bland. Oh, geez. So I added one more tablespoon of dijon, and that magical thing happened: the magic that results from what they call “tweaking the seasonings.” All of a sudden, I could taste everything: the toasted ground coriander, the chopped apple, the fresh peas from the campus farmer’s market, the earthy split peas, the smoked salt (that wasn’t from the recipe–I use smoked salt in just about everything these days, thanks to the box of it I brought here from Ontario), the cider vinegar, and of course, the mustard itself! Lesson learned for the millionth time: often, blandness has a shockingly easy and small solution. 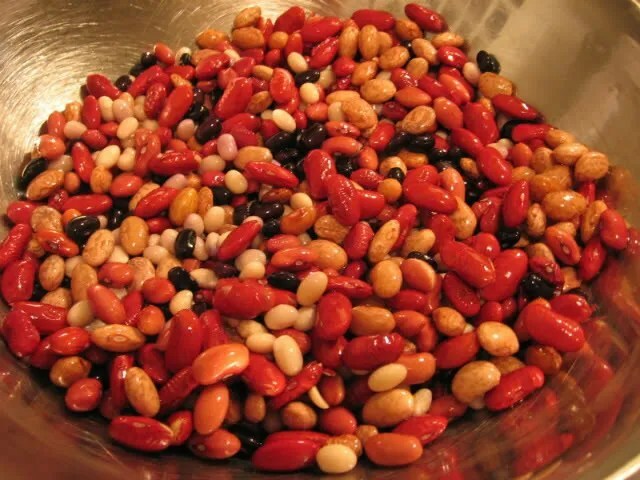 I’m using a broad definition of “beans” for my mofo theme– everything leguminous, lentil-y, etc. is fair game. So, here are some lentils with tomato and onion! 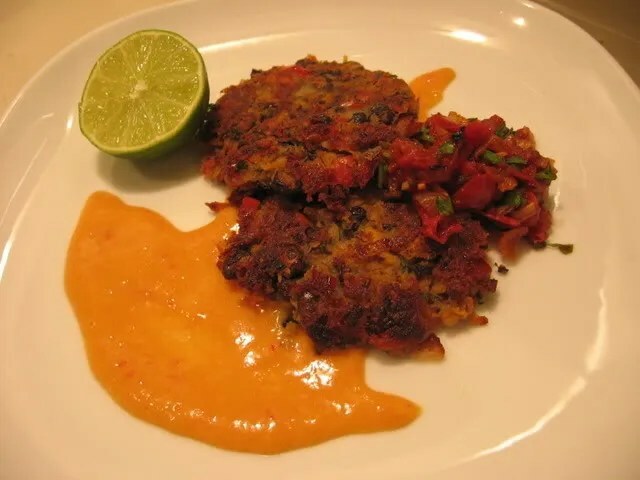 I’ve posted on the whole turka process before, via Mark Bittman: cooking up some lentils with basic seasonings, while frying up all the other chosen seasonings, then stirring the fried mixture into the lentils. This one’s from Heartsmart Flavours of India, Lentils with Tomato and Onion. Daal is always tasty, I find, no matter what you put in it. Here, though, I didn’t fiddle around with the instructions like I should have: I should have drained off a bit of the water, or used less water in the first place, because these lentils were seriously soupy. That wouldn’t be a problem, except that they were so soupy that the flavour of the turka got a little diluted. Those are my notes and cautionary tales! 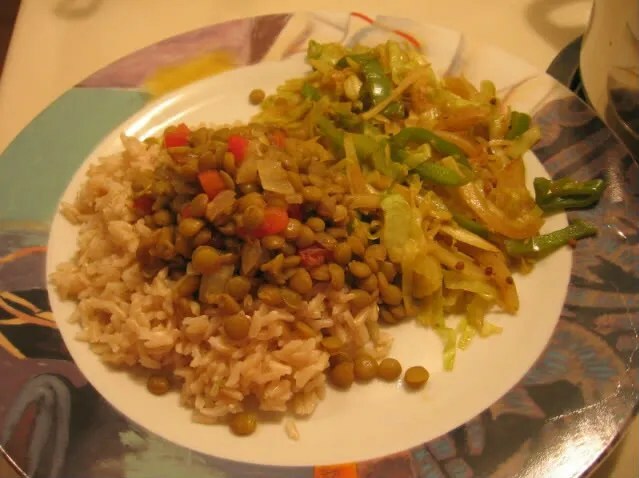 Pictured with the lentils are some brown rice and curried cabbage. Winter food! What a fitting first entry for my MoFo Beans theme–with hidden secondary beans in the form of coffee! I adapted the Red Bean Chili with Ancho Chiles and Coffee from A Year in a Vegetarian Kitchen for this one. 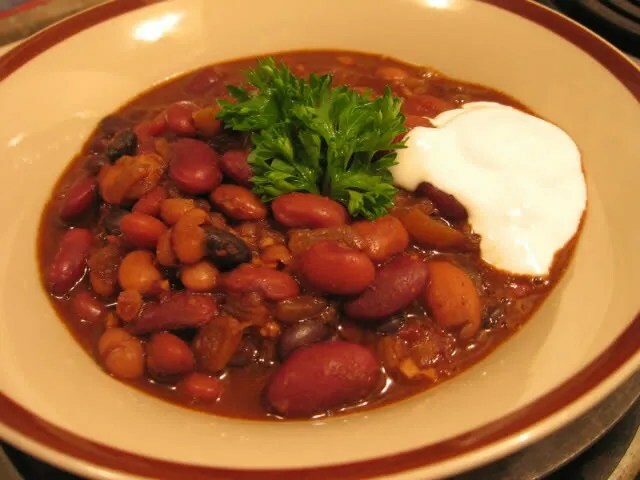 The main changes I made were to the kind of chile and bean: switched out the ancho, used a bulk bean mix called, I think, “Texas Chili Mix.” I’ve posted the recipe below, because it was delicious! It’s pictured below with a bit of Tofutti sour cream that I happened to have on hand, mixed with a bit of lemon juice. Soak beans overnight. Drain, place in soup pot with water and bay leaves, bring to boil, then lower heat to a simmer, and simmer for about thirty minutes. Add a teaspoon of salt, and simmer for about 45 minutes–beans should be getting tender. Discard the bay leaves, turn off the heat, cover the beans. Fry the onions in the oil in a skillet with 1/2 t. of salt, stirring often, until translucent and turning golden. Add garlic, fresh habanero, and cumin to skillet and fry for about two minutes. Add chile powders to skillet and fry for about another minute, adding a splash of water to deglaze. Scrape all of this into the bean pot, add the coffee and tomatoes too, bring the beans to a boil again, then down to a simmer and simmer until beans are very tender, about one to one and a half hours. (I only needed one hour.) 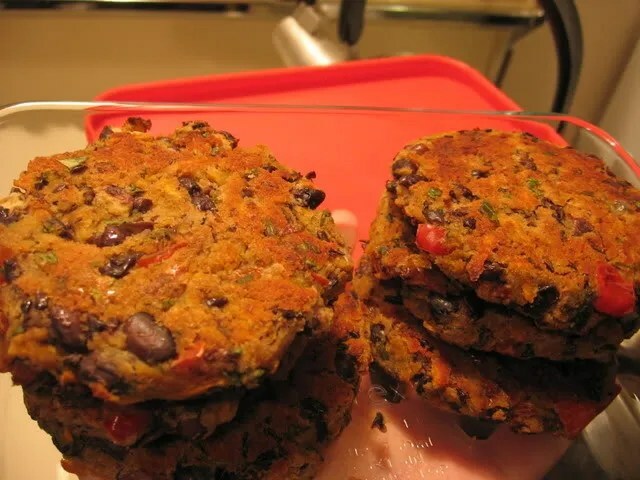 As always with beans, you may need a longer cooking time to get the desired tenderness. If you need to add more water, go for it! Taste for salt (I didn’t need any extra). The original recipe added 1/2 c. of chopped cilantro, but I didn’t have any on hand and it was great without it, but if you have some, go for it!